I’m surprised that Jamie’s Italian opened at Vasant Kunj without much noise. Even so, when we visit the restaurant for a weekday lunch it is nicely full with happy diners. And I must admit that I am happy to get a table without prior reservation, as the task of getting one in any new restaurant in Delhi is usually a nightmare. Jamie’s Italian is a large space on the 3rd floor of the mall. Show kitchens, a live counter where fresh pasta is being rolled and pantry-like racks stocking goodies for sale all lend it a warm appeal of an Italian family kitchen. The menu is not too elaborate – it fits neatly on one side of an A3 sheet – but has enough choice to warrant repeat visits. The other side features drinks, both, alcoholic and non alcoholic. They haven’t got a liquor license yet, but I am told that it should be coming very soon (maybe within this week), so today is all about the food. As an Italian restaurant should have, there is a choice of bread and nibbles including marinated olives, fried stuffed olives, bruschetta and antipasti. We, however, skip these and go straight for the primo or first course. The pastas are quite the highlight at Jamie’s. As is evident right at the entrance, all pasta is freshly rolled at the restaurant, as are the hand-tossed pizza bases. And if you miss seeing it, there are placards all over the restaurant reinstating the freshness of pasta, ingredients and food cooked with oodles of love! We order Jamie’s Sausage Pappardelle and Honeycomb Cannelloni Trio. Both are fab, and worth trying. The pappardelle are broad, flat pasta noodles that come with a ragu of slow-cooked pork sausage with red wine, topped with freshly grated parmesan and herby breadcrumbs. My kids give this dish a thumbs up as it is flavourful, without being spicy or too rich. The cannelloni trio has three pieces each stuffed with three different pureed fillings – spinach and ricotta; pumpkin; aubergine and sundried tomato. Although spinach and ricotta is my favourite, it is nice to have a choice of flavours in this dish. The cannelloni sitting on a bed of cheesy-tomatoes is very comforting and is something that I would love to dig into on a cold winter evening. From the choice of four pizzas – Margherita, Wild Mushroom, Spicy Chilli Lamb and Chicken Pizzaiola, we opt for the last one. It is not a cheesy pizza as we are used to having at most “Italian” outlets in Delhi/India. The lightly crisp base is smeared with a delicious tomato sauce that is sprinkled liberally with capers, sundried tomatoes, olives, blobs of creamy mozzarella and, of course, chicken. It is rustic, each bite offering an interesting mix of complementing toppings, and lives up to Jamie Oliver’s cooking style as one has seen on his TV shows. From the mains, we skip the Grilled Chicken Puttanesca and Giant Pork Meatball, and opt for the Burger Italaino. This is the only part of the meal where I am a little let down partly because of its appetizing presentation that raises one’s expectations, but mainly because a chargrilled lamb burger can certainly be juicier and more flavourful. The melted fontal cheese, sweet tomato salsa and pickled chillies add lovely textures, but the lamb patty lacks oomph. The accompanying homemade funky chips are great though. Hand cut and triple cooked, they are topped with crispy garlic and herbs. There is also a Veggie Burger, and the grilled Aubergine Parmigiana sounds like a good vegetarian main. Ideal for a family outing, the kids menu comes in two sizes – for little kids and big kids. signature cook n serve ware, Jamie's napkins and more. pasta that is rolled fresh in front of your eyes. 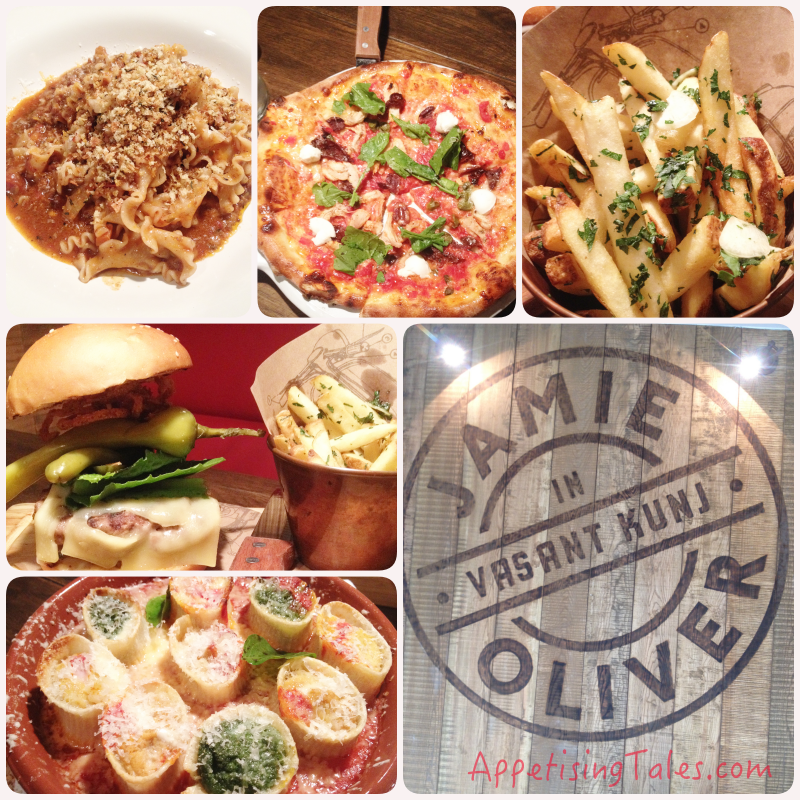 If you like your pasta to be loaded with cream, cheese and garlic (like a very popular Italian restaurant chain in Delhi), you would probably not care much for Jamie’s Italian. But if you’re familiar with and like Jamie Oliver’s style of cooking, or simply want good, unpretentious food, I highly recommend this restaurant. My first experience is fantastic and I will certainly go back another day to try the antipasti and desserts, and the Afogato Martini once the liquor license comes. 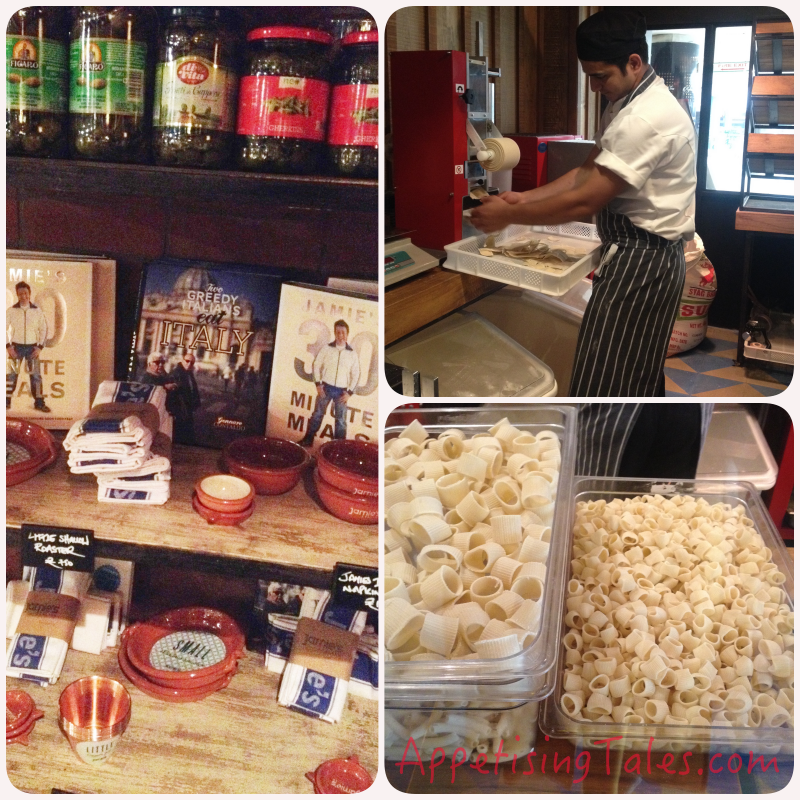 Jamie’s Italian, 3rd floor, Ambience Mall, Nelson Mandela Road, Vasant Kunj, New Delhi – 110070. Prices: Antipasti Rs 205 onwards; Pasta Rs 195 (for half portion) onwards; Pizza Rs 350 onwards; Mains Rs 325 onwards; Desserts Rs 275 onwards.